What is the Difference Between Premium and Free Themes? As mentioned before, premium themes come with significantly more features than their free counterparts. 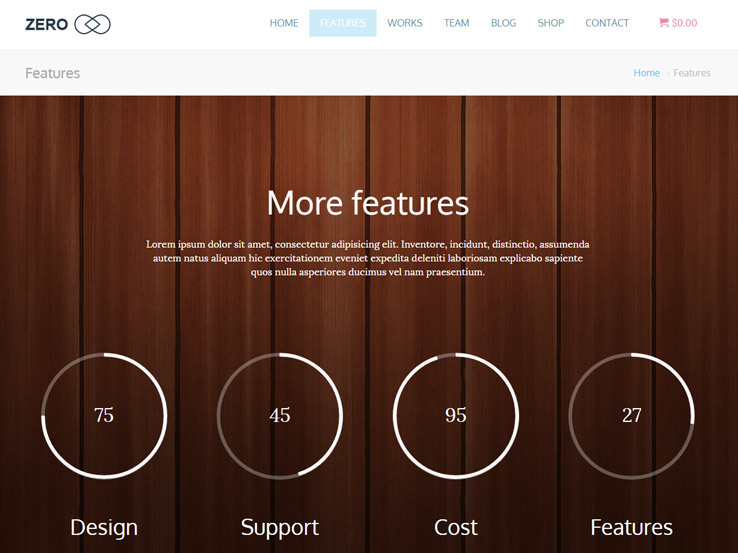 However, one key difference is that premium themes also come with developer support. For those who are complete beginners when it comes to building WordPress sites, developer support is invaluable. They can help you if you get stuck at any point while setting up your theme, and they can even help you troubleshoot any problems you might encounter. On top of that, premium themes are regularly updated, which means they are less likely to cause issues when WordPress or plugins release updates of their own. There are several marketplaces that sell themes for WordPress such as ThemeForest, Mojo MarketPlace, and CreativeMarket. There are also independent developers who sell themes from their own websites, such as Nimbus Themes and WPZoom. Finally, there are also some developers who created popular premium frameworks such as Genesis. When searching for a premium theme, post roundups like these should be your first stop to narrow down your options. Since there are so many premium theme providers, it’s nearly impossible to walk through them all to find out which one is right for you. That’s why theme roundups like this exist: to help you save time because we’ve done all the research for you and picked the best of the best to feature here. 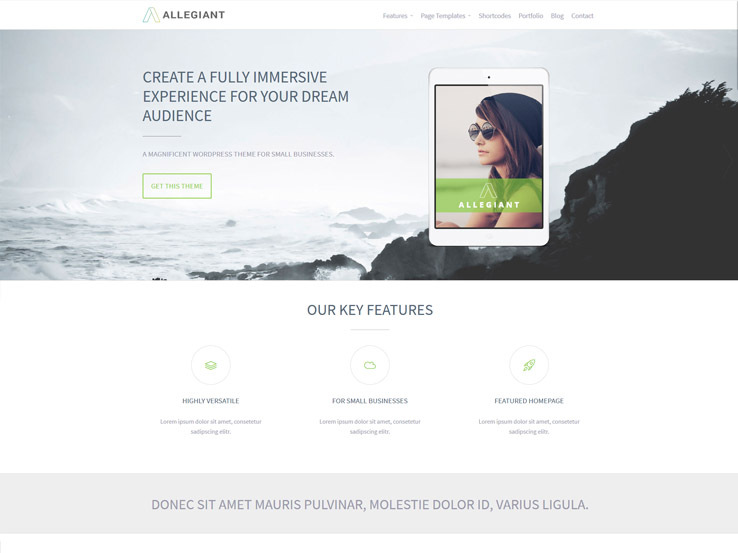 The Allegiant theme is a great choice for small businesses looking to have a simple, clean, and elegant website that’s easy to manage. The responsive template comes with a wide range of useful features including eCommerce support if you’d like to sell your products online, and a blog that can be useful in sharing your expertise and generating traffic from search engines and social media sites. A beautiful fullscreen slider welcomes visitors upon landing on your frontpage, and is great for highlighting important aspects of your business. The slider has overlaying text and a button to drive visitors to your important pages. Besides, you’ll find several business-focused modules such as team members and testimonials to build your credibility, as well as portfolios to showcase your work. Lastly, the Allegiant theme is highly versatile, which allows you to easily customize it according to your needs. Whether you’re a startup or an established business, you need to have a website that leaves a good impression on your potential customers. You want a website that looks clean and professional, is easy to manage, and above all, has all the functionality required by your business. 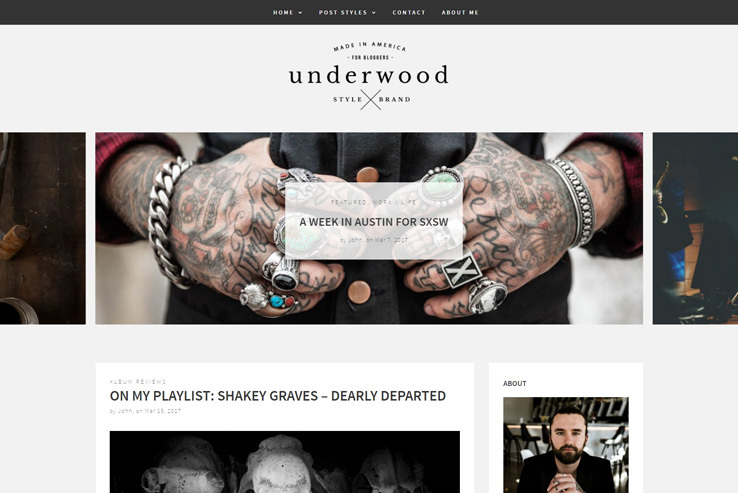 If that sounds like you, check out the Underwood WordPress theme. This template empowers you with plenty of customizable features, a premium design, and top-notch support whenever you need help. The large logo at the top is great for branding while the frontpage slideshow is perfect for highlighting your best products, services, or promotions. In terms of variety, you get the choice of a grid-style homepage layout with or without sidebar. You also get 9 custom post types. Besides the standard text-based content, you can easily create audio or video content to effectively market your business. And if images are your thing, check out the gallery post format that can feature in-page slideshows. The Underwood theme integrates well with social media. It makes it easy for people to follow you and share your content, and you also get an awesome Instagram feed to display above the footer or in your sidebar. Also, the template is optimized for search engines, mobile responsive, and is provided with ongoing premium support. 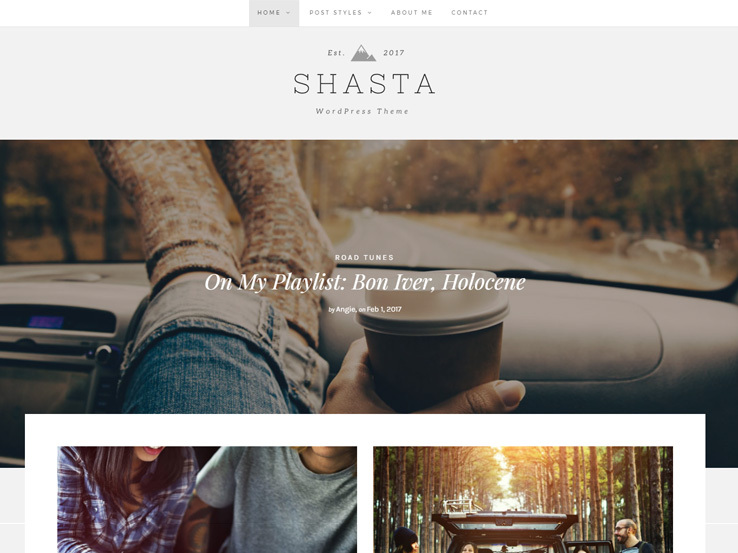 Shasta combines a stylish modern blog design with a set of robust features and functionality, making it one of the best premium WordPress themes. 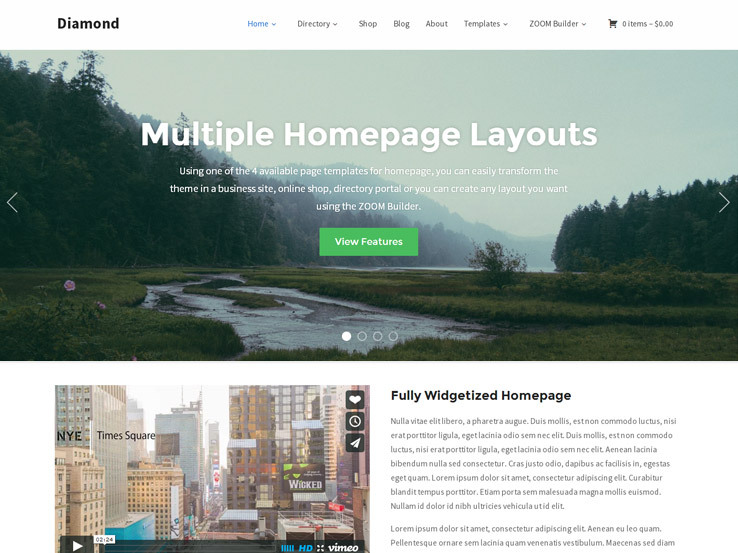 To start with, you get 4 frontpage layouts including a fancy style with large featured images, and a cascading grid-style that can be set to full-width or have the sidebar. All these layout designs include a large full-width banner in the header with a link to your latest blog post. Shasta offers 9 custom post formats. Besides the standard post format that can be full-width or with the sidebar, you have audio and video posts and galleries with large or small banners. Use the audio post type to share your playlists, embed YouTube or Vimeo videos, or if you’re a travel or photography blogger, create galleries with photos of your adventures or work. The Shasta WordPress theme is mobile-friendly and search engine optimized. This means you’ll be able to attract visitors from search engines whether they’re on mobile, tablet, or on desktop. Besides, the template supports the 2 best WordPress performance plugins – WP Supercache and W3 Total Cache. Shasta’s other features include hundreds of ready-to-use Google Web Fonts, Contact Form 7 support, WooCommerce support, a color picker for customizing colors, and extensive theme documentation. 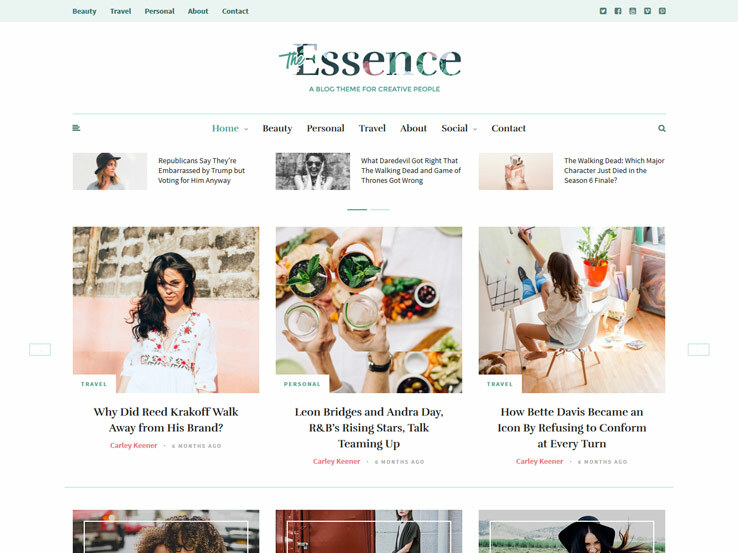 If your business is targeted towards the female customers, you should invest in a specialized feminine template like Essence. As it features 15+ blog layouts, you are free to explore all the styles and choose the most suitable one. Multiple menu locations with multi-level drop-down support for the main menu will ensure a superior browsing experience for the visitors. In addition to the regular sidebar, there is a special sidebar that can be revealed by clicking the hamburger icon. You can place the customized widgets or the default ones on any of the widget-ready locations. Check out the options panel to manage the styling aspect of the website. The Simple Theme has a stunning one-page layout, which is starting to become the trend for companies and startups that are looking for the ideal premium layout. Why is this the case? 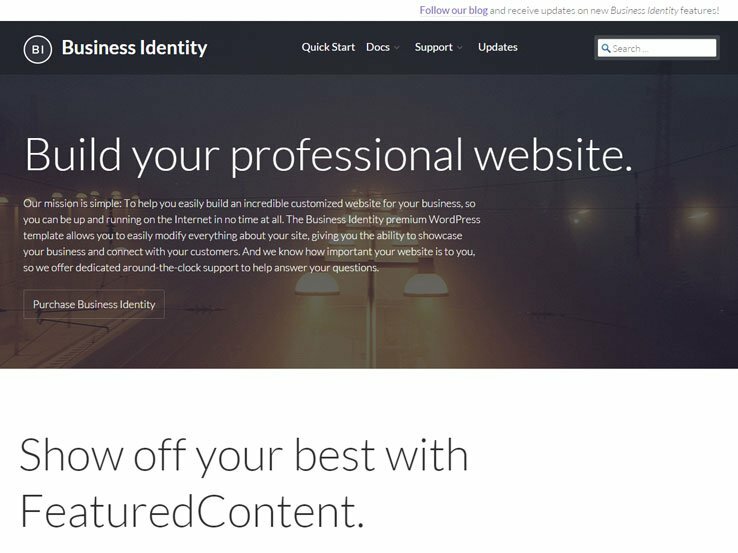 Well, because the one-page layout puts all of your content in one spot, preventing the need for people to go scrambling around your site for things like articles, team member profiles and more. For example, an established business can reveal images and descriptions for each of their team members, while startups can utilize the cool parallax header area to quickly explain what it is the company does. In addition, the header module includes a button that helps you send people to a landing page to bring in email subscriptions or sales. The testimonials also come into play for startups, since it’s not always the easiest thing in the world to convince new customers to get on board with a new product or service. We particularly enjoy the social media button section. Not only are the buttons much larger than any other premium themes you would find on the market, but they pop up with animations when people scroll over them. It’s premium features like these that make the Simple Theme just a little bit better than the rest of the competition. Also, you generally need an extra plugin to showcase your most recent articles, but this theme has a built-in area for highlighting your latest articles, with large featured images and descriptions. Does your start-up or established business consider blogging as a critical marketing strategy? If yes, Wonderwall should be one of your top choices. It features five post styles along with different post header variations to display the content. Feel free to check out the available homepage designs and choose the appropriate one for the site. Collect leads by using the pre-packaged newsletter subscription widget. You will also find several other customized widgets to display additional company information on the sidebar and footer. Don’t forget to utilize the stylish social media buttons to connect with your followers on various social platforms. The Venture Pro theme is one of our favorite premium solutions in the Nimbus Themes library packed with many features like icons, fonts, and parallax effects. The theme puts a strong focus on highlighting beautiful images, so you can create numerous sliders and galleries. Most of the settings you need are on the back-end of the WordPress site, but a custom CSS module is available if you have experience with code-editing. Many startups are going for one-page layouts, and the Venture Pro theme provides several areas that enable you to keep your customers on a single page for longer periods of time. The whole point of a website is to get people to contact you. Therefore, a contact form can be implemented within a few seconds. You can also share social media icons in the header or in one of the lower modules. Tell customers about the people working behind the scenes, and share information such as personal social media links and job titles. As with all business themes, it’s nice to reveal quotes from people who have worked with you in the past. For example, if you’re a new startup, no one is going to consider you reputable unless they see that other people have put their trust in you. Therefore, the testimonials section offers an image and quote that shows up when someone scrolls down to that section. The mobile responsiveness is a nice touch, and the shortcodes roundup the effectiveness of the theme, considering you can quickly implement items like buttons and columns. 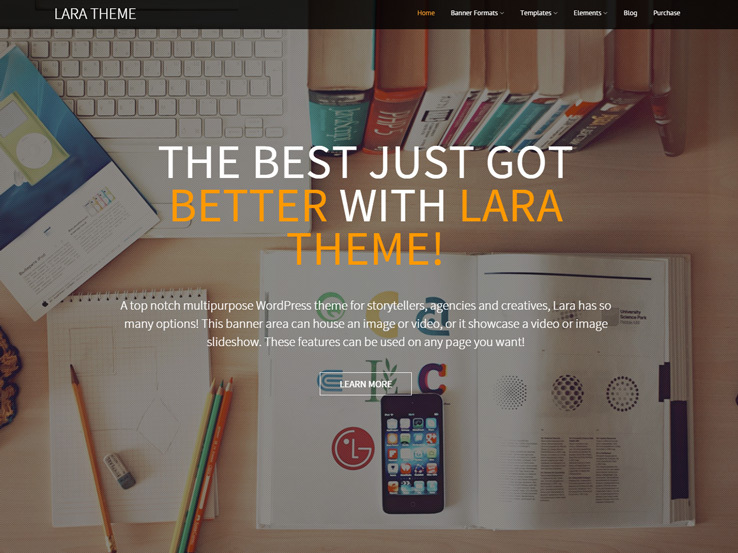 The Lara business theme provides a stunning premium layout with a one-page design and endless possibilities. The point is to generate the website of your dreams, so this theme gives you nine different rows to include when structuring the way your one-page website is going to look. This works wonders for established companies and startups since you can quickly talk about the advantages your business gives to customers. Highlight your blog feeds directly from the homepage, show sliders with images, and implement an area with team photos that give off a sense of personality. But what about the layout of your blog? When giving out free content to your customers you want to ensure that you offer some variety and uniqueness. That’s why the Lara theme has six different blog layouts ranging from simple excerpts to tiled images. The video/image banner is convenient when you want to immediately share what your company is all about. As an example, many startups are known to piece together an animated video that can be shown at the top of the website. This way, customers don’t have to figure out what you do by themselves. Along with mobile responsive features, the Lara theme has a wide range of versatile color combinations, strengthening your branding strategy from the start. On top of that, this theme includes various shortcodes and scripts. This way, it doesn’t matter whether you’re a seasoned developer or averse to technology. You can speed up the design process and make your website look great. 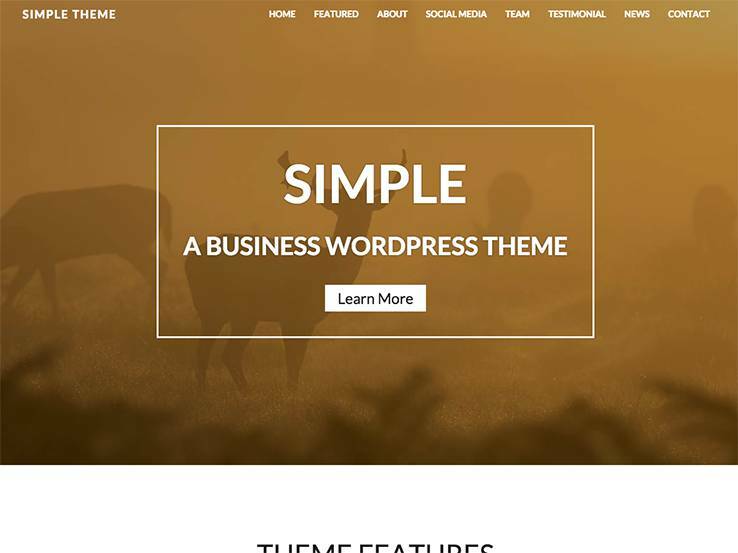 If you run a startup or successful business, consider the Simple Business WordPress theme when building your next website. It provides some sleek designs and somewhat feminine layouts for a beautiful and creative take on the business world. The premium features include responsive layouts, Font Awesome icons, and Google Fonts, all of which are important when trying to brand your website. The whole point of building a site for your business is to bring in new customers. How does Simple Business help you with that? To start, it provides a wide range of areas with call-to-action text and buttons. These are easy to implement, and you can customize them however you want. In addition, one of the homepage sections is there for you to outline your services. Use one of the many icons with each of these services and explain why your company does the job better than others. You can even go in-depth with the About Us area, explaining how your company came into existence and about some of the people who are working for your business. Post images of your employees, and share information about their personal lives. You can even link to their social media pages to send more traffic their way. The name is simple, but the Business theme packs a huge punch when it comes to premium features for your startup or established business. As with many of the themes from the Nimbus library, this is a one-page solution. It comes with various parallax shortcodes which still look great on mobile devices such as tablets and phones. The slider options make it a breeze when trying to scroll through your promotions and events, and the unique grid-style blog layout improves the way your content displays to potential customers. The Business theme has a row-based front page, with several modules for promoting various aspects of your business. For example, your services can be displayed at the very top of your website, and testimonials are paired with images of your past clients. We talked a little bit about highlighting your services, but the Business theme has a premium feature that you can’t find anywhere else. We’re talking about a tabbed services module where customers can click on the different services they’re interested in. This unveils additional information about that particular service, and you can even insert images to go along with what you’re trying to explain. As a bonus, each of the tabs allows a button which sends them to specific service page or a contact page to get the sales process going. 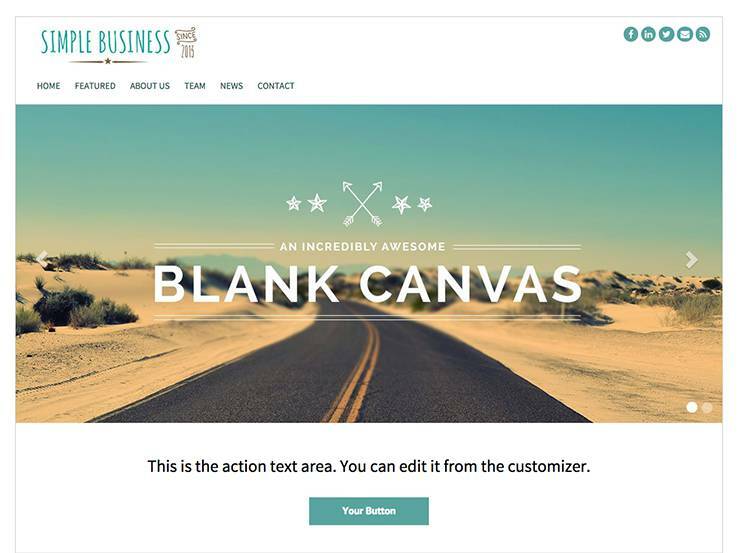 Along with social media options, shortcodes, SEO settings and typography by Google Fonts, the Business WordPress theme gets you started in the right direction, regardless of your business size. 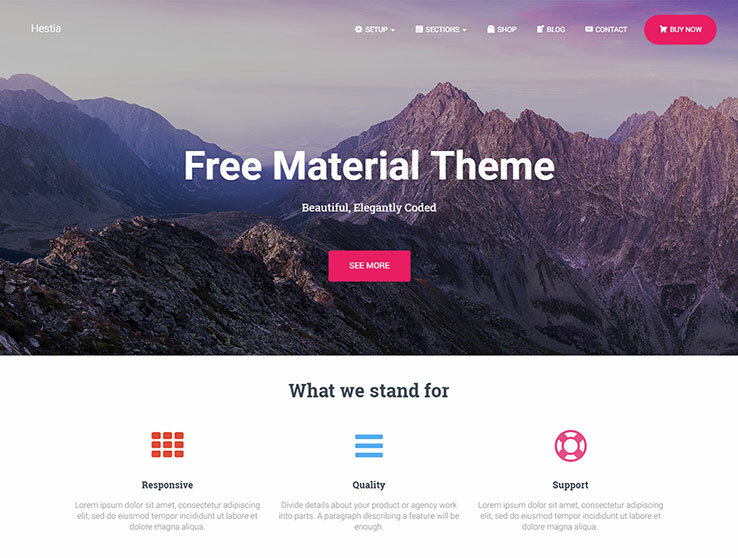 Hestia Pro is a one-page material design WordPress theme catering to startups and businesses. With its responsive nature, your websites will render perfectly on all screens and device types. More so, since it is a multipurpose theme, Hestia Pro comes packed with plenty of functionality to represent you and your business, promote your content and products, and stand out from the rest of your competition. For instance, WooCommerce integration supports an online shop, compatibility with the SiteOrigin Page Builder allows for drag & drop page building, and you can use any translation plugin to help you translate your content. Additionally, Hestia Pro has built-in SEO optimization so your site is always indexed and ranks well in search results. Plus, its clean code ensures fast page loading and added security, the Live Theme Customizer makes branding your business simple and easy to do, and the custom backgrounds supporting multiple media types add stunning visual appeal to those first entering your website. 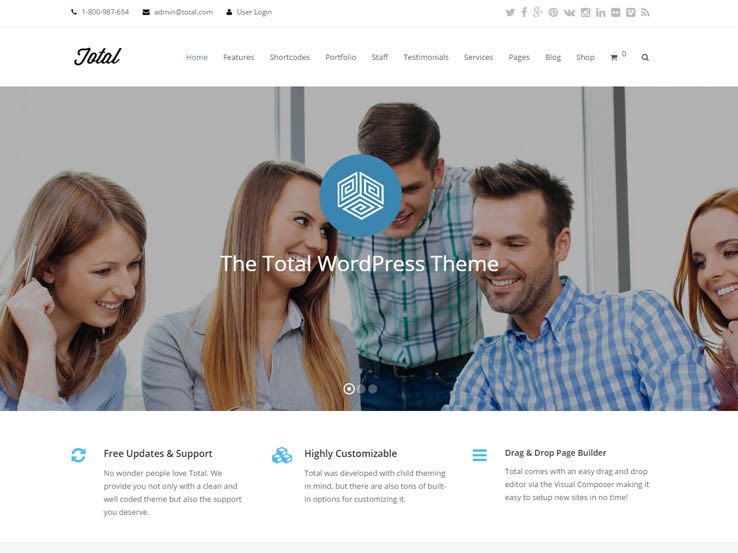 Total is a super clean, modern, and feature-rich WordPress theme from the hard working team at WPExplorer. These are the same folks that brought you popular themes such as PhotoPro, Earth, and Office. WPExplorer is known for providing excellent support and superior quality themes so you can rest assured that you will be well cared for and that your theme is on the cutting edge of WordPress technology. The Total theme for WordPress offers the ultimate in multi-purpose flexibility without the bloat and UX confusion. The admin panel is easy to manage and is filled with a variety of customization options, giving you complete control over the look and feel of your website. It’s fully responsive and compatible with all the must-have plugins like WooCommerce, Visual Composer, and others. Regardless of your industry, the Total theme is a must see for your next WordPress project. By now, I would hope you’ve heard of the Divi theme. 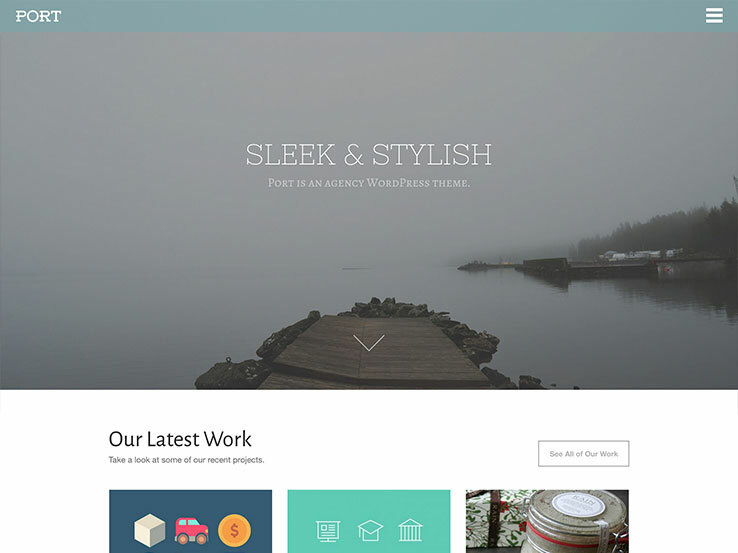 It’s stylish, sleek, functional, and arguably the best premium WordPress theme on the market. Yes, you must signup for an Elegant Themes subscription package to get the theme, but the fee is around the same price as a single premium theme, and you get access to all the themes in their library. 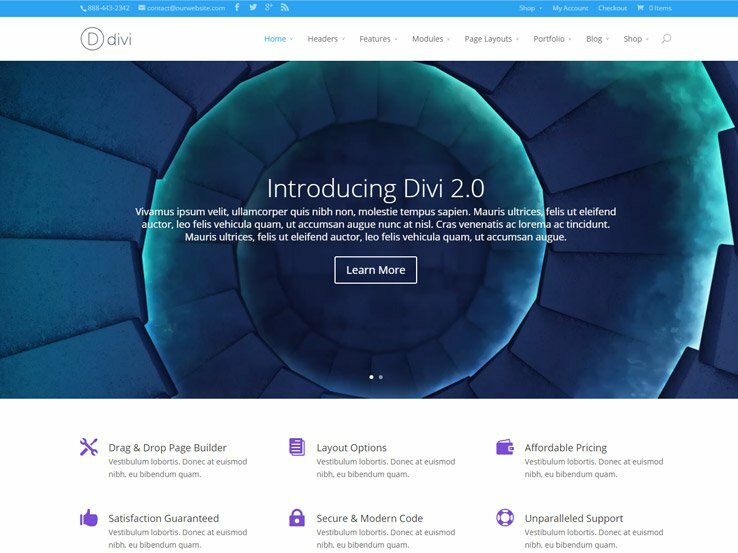 What makes the Divi theme so wonderful? It comes with the Divi drag-and-drop builder, which is one of the best in the industry, using Divi modules for placing items for social media, tabs, blogs, calls to action and more. The pre-made layouts ensure that you can make your website look completely unique without spending a fortune on customization. 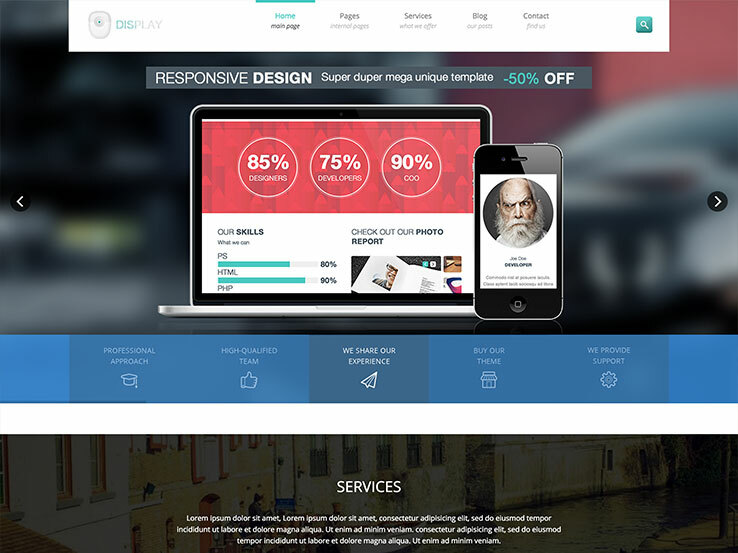 Divi is also responsive for viewing on all mobile devices. 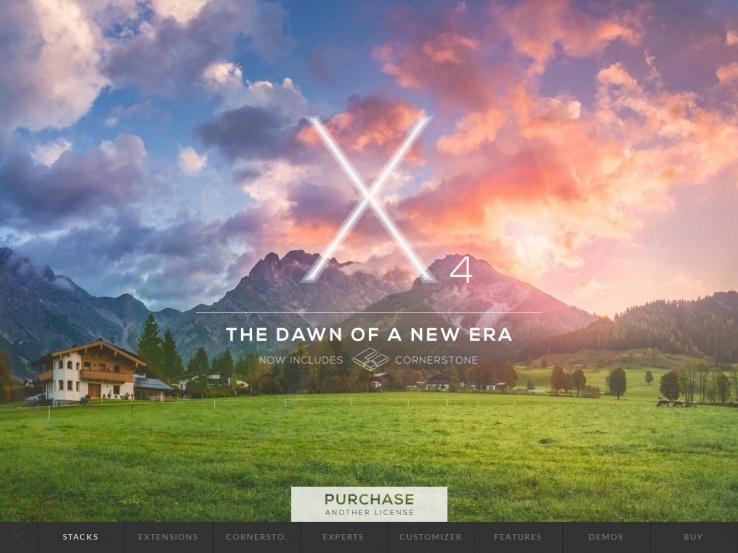 The X Theme developer states that they are bringing along a new era of WordPress theme design. That may be true since the X Theme is a handy tool for anyone who fancies themselves a website designer. The theme comes packaged with the Cornerstone page builder, making it easy for you to drop elements on your site, and the building experience is 100% on the front end, allowing you to see every step before hitting the publish button. We enjoy the app-like interface, which generates a clutter free and intuitive experience the moment you activate the theme. On top of that, you can choose from various extensions and elements, and the theme includes several unique layouts to speed up the design process and make your website stand out from the crowd. 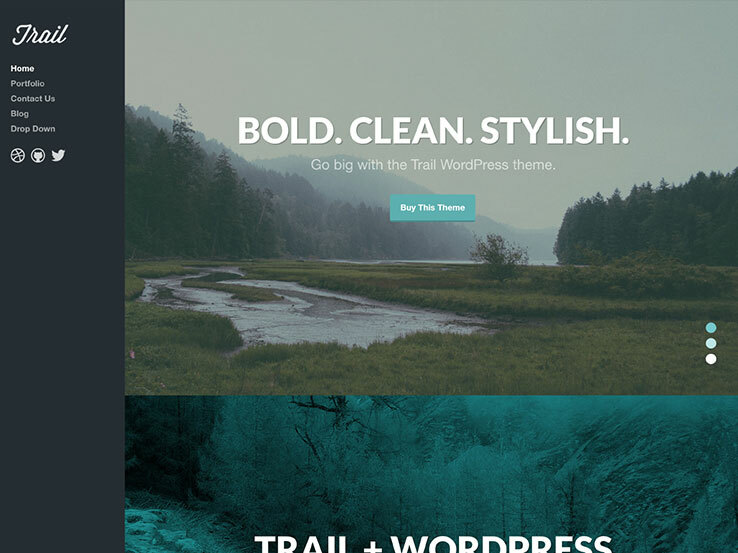 The Trail theme is a responsive premium theme with a strong, parallax homepage, designed to capture the attention of anyone visiting your website. The shortcodes are always handy to add elements such as columns, buttons, and accordions throughout your website. Uploading your logo is quick, and building a filterable portfolio serves you well when looking for a job or while freelancing. The Trail theme looks unique, with its sticky menu positioned on the left-hand side. This makes it easy for your visitors to navigate around your website. The theme also includes a photo stream and social media buttons to grow your social media presence. 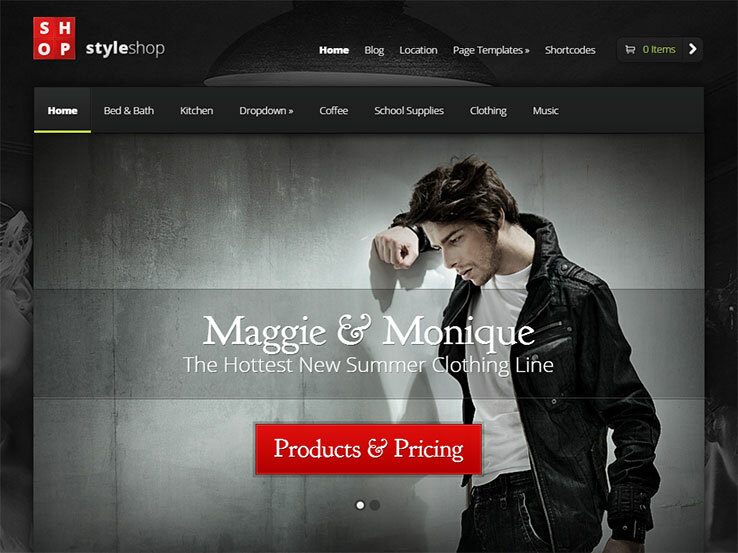 The StyleShop WordPress theme, an eCommerce option, offers the ideal setup if you plan on selling products online. In fact, if you ever plan on generating an eCommerce store, don’t skimp by opting for a free theme. ECommerce websites are extremely complex, and it’s worth spending $50 to make it a place where customers want to go. This all-in-one solution provides unlimited color options, allowing you to brand your site however you want, and the responsive design looks stunning on all phones and tablets. The theme options and shortcodes bring you into a design atmosphere suitable for beginners and advanced users alike. Additionally, the various page templates ensure that your customers see something new whenever they land on a different page or post. The Diamond theme, from WP Zoom, is a multi-purpose premium theme for those who want a clean way to sell items with the WooCommerce plugin. The theme includes multiple homepage layouts, providing you with the option to choose what you want your website to look like. This gem works off the Zoom framework, giving you more customization options. The directory module is a unique component, considering you can create an area for pushing people to directory listings about businesses or services in your area or around the world. Lastly, Diamond is responsive, so it works on all devices. 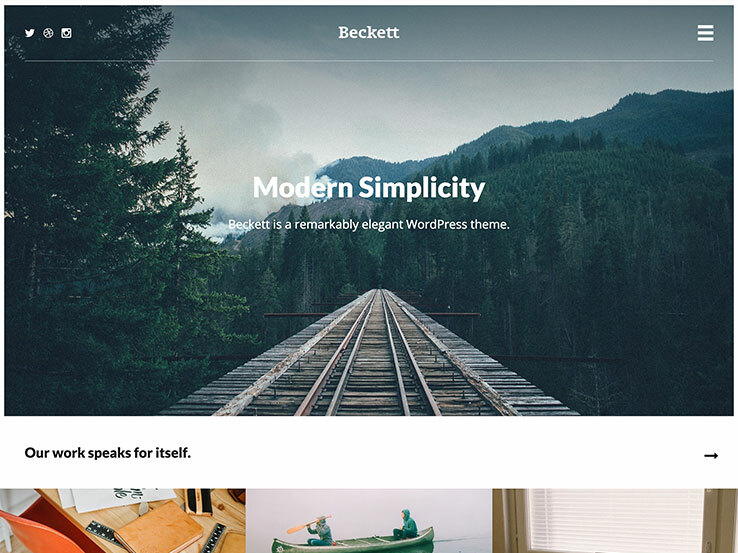 Try out the Beckett premium theme if you enjoy elegant and professional layouts. The theme provides a responsive layout and a big homepage slideshow for showing off your best work or content as the first area that people will see when landing on your website. The slideshow shortcode works as a quick way to turn a simple group of images into a lovely slideshow. Shortcodes are also available for creating items like buttons, tabs, toggles and columns. Upload your logo with ease and play around with the custom widgets to turn your website into something completely unique. The testimonials section is a favorite of ours since it doesn’t require any advanced coding to place some nice quotes about your company on the site. 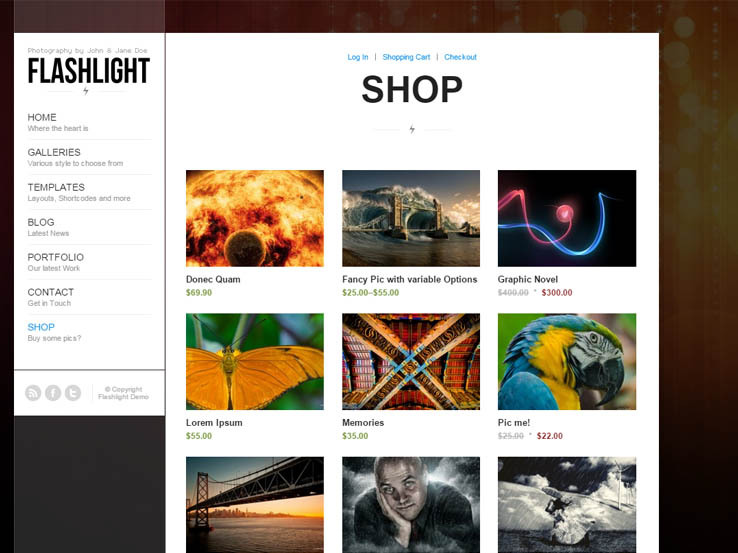 Those using the Flashlight theme can expect five different gallery options, each of which makes your site a little more unique when showing off your images. The full-screen slideshow is a thing of beauty since it allows you to use high-resolution photos for promoting your business. These are sure to grab attention and put more money in your pocket. Choose from multiple layout options, and use the content importer so you don’t have to start from scratch after buying the theme. Unlimited portfolios are available. As you can see, this theme is primarily designed for those showing off their creative works, like photographers or artists. The visual shortcodes are a little easier to use than regular shortcodes since you can see the finished product beforehand. Are you looking for a steady income online? 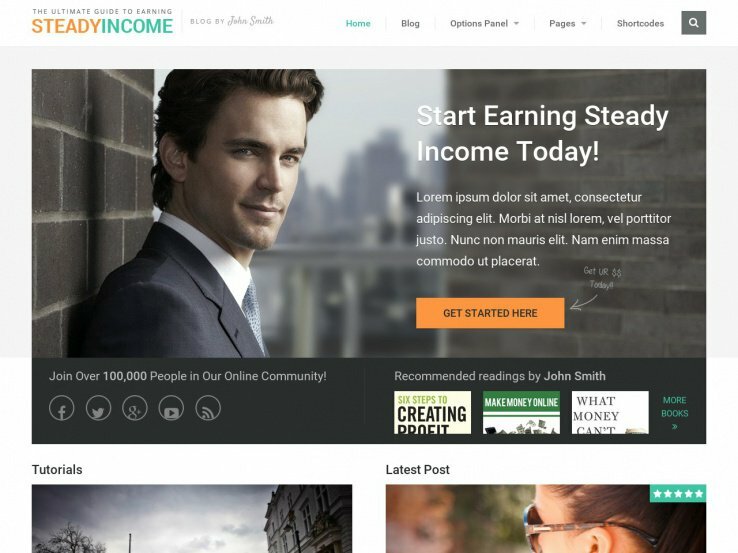 Well, maybe you should check out the SteadyIncome premium WordPress theme. The idea behind the theme is for bloggers to build a personal brand without skimping on features or spending too much money for a theme. The responsive design has various elements for branding, affiliate marketing, and selling items. To start, you receive a powerful subscription tool and a featured products section for sending customers to the most popular items in your store. The prominent social media icons are a standout feature, considering many themes just leave those icons to look small and boring in the corner. The theme includes an area to include logos of other publications and places you’ve been featured in. Adsense is integrated with the theme, and you can always use the WP Subscribe Pro plugin (included) to bring in more customers. Zero is a multi-purpose theme with a clean and minimal design that still looks sharp and elegant while providing some impressive features. It has three different types of home pages to create a blog, business, or a one-page site. The transition effects are gorgeous. It includes a portfolio, sticky menus, font icons, scroll animations, and more. Its responsive design is sure to look amazing on any size screen or device. It includes the Revolution Slider plugin, which includes transition effects, animations, and 3D effects. Zero has both a wide and a boxed layout. It includes the IcoMoon app that lets you design and build your own icons. The theme includes the drag-and-drop builder plugin known as Visual Composer which includes over 40 content elements with styling options. You can manage and make customizations from the frontend or backend. It’s built on the Tesla Framework which gives you the tools to easily customize the look and functionality of your theme. Changing the colors and the fonts is a breeze and to top it all off, Zero is compatible with Bootstrap 3 mobile-first framework. It’s fully compatible with WooCommerce. This is a great theme for portfolios, blogs, creative agencies, artists, and businesses. Business Identity is a theme that was designed specifically to help businesses show off their business and connect with their customers while building and maintaining a professional look and feel. It includes a responsive featured content slider that supports background images and includes lots of design options. The theme itself is responsive so no matter what device your visitors are using, your site will look fantastic. It also has a front-page template that takes advantage of the MORE tag so you can build home pages that shine and stand out. It has lots of social icons. It’s fully customizable and includes three widget areas (which include front-page widgets), two menus, and a custom logo. You can customize the color palettes, upload custom headers, and more. It’s SEO friendly to help you rank higher in search engine results. It’s also coded so that it doesn’t show readers redundant content as they click on your services and features. It was built with entrepreneurs in mind and would make a great theme for both large and small businesses including freelancers, creative agencies, artists, and studios. 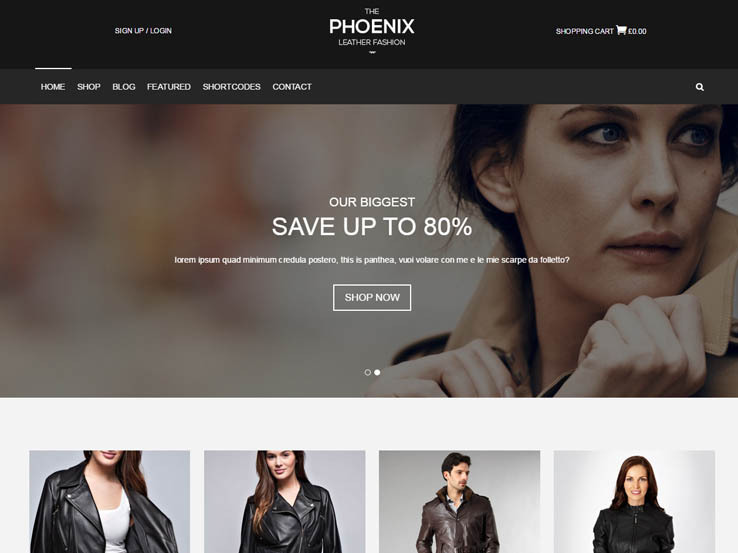 Check out the Phoenix WordPress theme if you’re looking for a premium solution with darker color shades and a clean and modern design. Overall, the theme has demo content for leather fashion, which can be swapped out for other types of fashion, or just about any type of product. The Facebook login integration is suitable for most companies, considering people are more willing to log in with their existing Facebook information. This can help you increase the conversion rates on your website. The two creative styles work nicely for boosting brand awareness, and the backend supports a wide range of branding modifications, starting with your blog and going to simple things like the logo. Over 50 shortcode elements come with the Phoenix WordPress theme, meaning that you’ll rarely have to touch a line of code. What’s great is that the Phoenix theme is completely responsive for viewing on mobile devices. In addition, it connects with the WooCommerce plugin so you can sell your products in style. Several homepage demos are included, and you receive access to quite a few premium plugins such as the Revolution Slider. This is a beautiful WordPress plugin with the ability to turn your slideshows into something special. Incorporate overlaying text and buttons, and use many animations along the way. The Visual Composer plugin is also packaged into the Phoenix theme, further advancing the development process and preventing you from needing a lot of design experience. The Port theme looks sleek and stylish for any business interested in a wide variety of features. The premium design has mobile responsive elements which make your website look great on any device. We like this theme because it provides quite a few parallax backgrounds, which are a great way to capture your visitors’ attention and add call-to-actions. The slideshow shortcode allows you easily insert it into any page or post without the need to touch any code, and the custom widgets are just as simple to use as the logo upload button. Localization support is a bonus for those who want to connect with a global audience, and the filterable portfolio presents your past work in a professional manner. You’ll notice that the entire header area takes up most of the screen, so you can include overlaying text and even a button to point your readers to your most important page. After that, it’s more of a one-page WordPress theme, with a portfolio, a services module, several call-to-action rows and a team section. Add your employees’ images, titles and descriptions as well as their social media profiles. The blog section is the best way to boost your SEO and show people that you are willing to share quality content for free. Along with button shortcodes, video support, Google Web Fonts and some pretty amazing support, you can’t go wrong with the premium theme called Port. 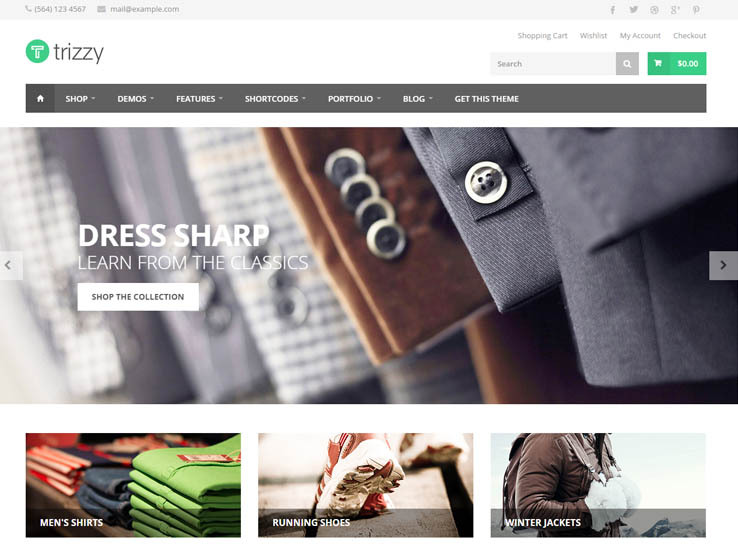 The Trizzy WordPress theme has a solid multipurpose interface with a WooCommerce setup. It’s a great choice for small startups that are getting ready to launch online stores since the WooCommerce plugin is ideal for getting up and running with your own eCommerce shop. Simply upload the plugin, place your products on the site and connect your payment processor. The Visual Composer plugin on the backend is exactly what you need for the ideal drag-and-drop interface. 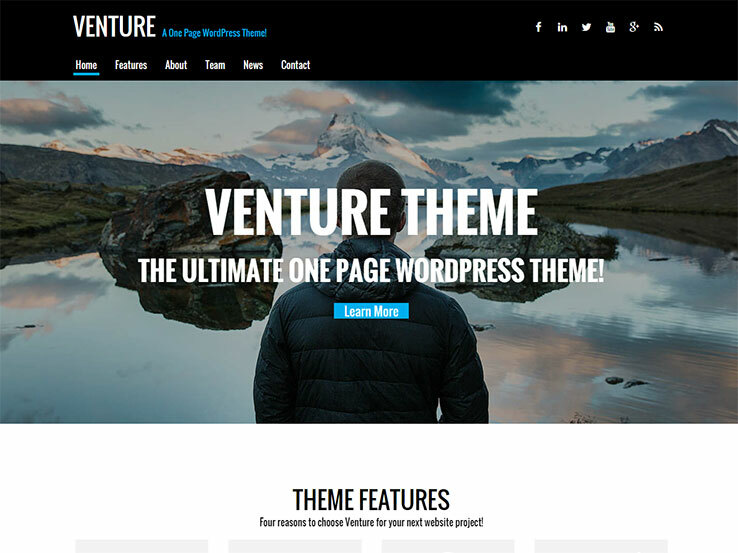 This theme offers multiple layout options, which is a wonderful bonus, considering you can differentiate the way your website looks from the competition. Trizzy includes mega menu as well, which means that you can create as many pages as you want and still have an organized way to show people around. This pairs well with any eCommerce shop because many of these websites are going to have lots of category and product pages. The theme is completely responsive for viewing on mobile devices, and it has an advanced search key for users to type in keywords for your products. The dynamic content loading gives your product images a dynamic effect, while the beautiful masonry blog is ideal for getting your content out there and boosting your search engine rankings. The nicest hotels require a solid website, so it makes sense that a startup hotel goes with the SixtyOne WordPress theme. This theme is completely responsive with tons of white space to keep your customers interested in what you have to say. The flexible homepage layout retains two widgetized areas for keeping your modules organized and clean. The booking form is the main reason you would go with the SixtyOne theme, considering you can quickly get people to book rooms online. The four content types are rather useful as well, with options for testimonials, rooms, galleries and slider items. We like the way the Room content types are setup because they have beautiful imagery, descriptions, and spots for people to see your amenities. A few custom widgets are useful for displaying social media buttons on your website, while the translation features come in handy for all hotels, considering many of your guests will come from foreign countries. You can upload your own logo in the backend of your website. The slider supports high-resolution images, beautiful effects, and text overlays. 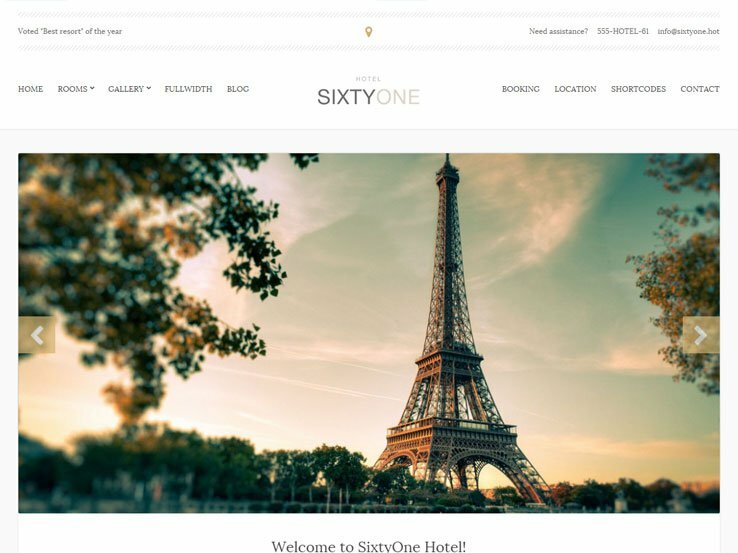 If you’re a burgeoning hotel owner, the SixtyOne WordPress theme is certainly one to keep your eye on. Baylie is sure to grab the attention of anyone who lands on your website thanks to the stunning full-screen slideshow which allows you to add a brief description about your business along with a call to action that sends the visitors to your sales pages. It’s a great way to promote a product or a service. Show your portfolio in a grid-based layout and share a few testimonials from past clients to build your credibility. You can also share logos of past clients and use the blog to share valuable content with your audience and improve your search engine rankings. The theme has several shortcodes which remove any need to work with source code and allow you to insert buttons, columns, and even sliders. Baylie is fully responsive and localization-ready so you have the potential of translating your website into another language and working with international clients. Several custom widgets provide you with a somewhat of a drag-and-drop interface so you can add your social media icons, recent posts lists, and more. Easily customize your colors, fonts, and upload your own logo. 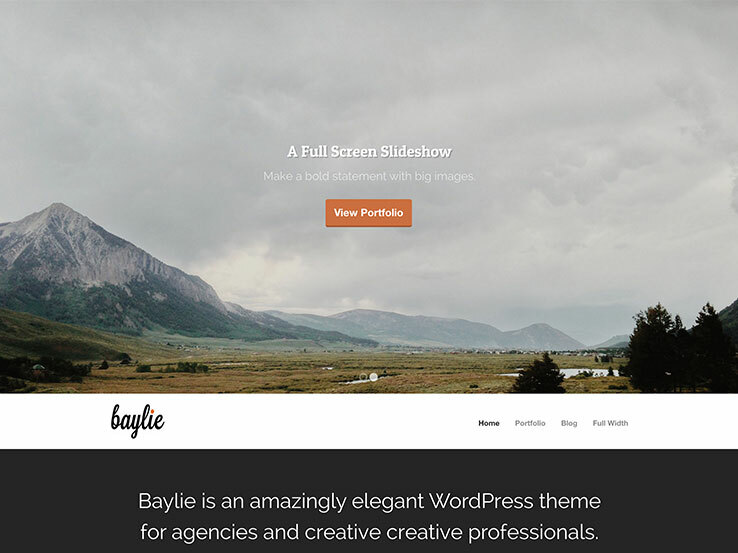 Finally, the theme comes with extensive documentation and fast support so give Baylie a try if you’re looking for a user-friendly theme. Consider the Blazsok theme if you’re looking to create an online store. 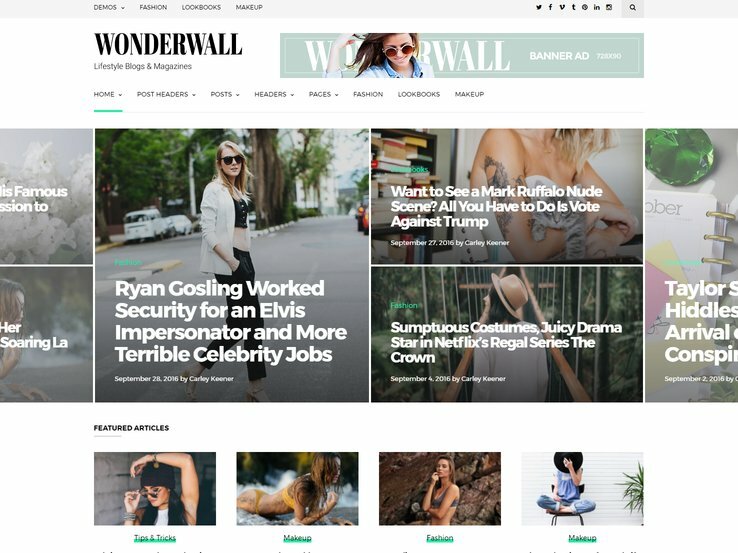 The theme has several different layouts suitable for a variety of stores and the best part is that you can mix and match any of them to create a completely unique look for your website. On top of that, this theme includes quite a few premium plugins for free. Visual Composer is one of those plugins, giving you a drag-and-drop interface to easily add various elements anywhere on your pages. Essential grid layout ensures your products display in an organized and clean grid, while Slider Revolution and Layer Slider allow you to create beautiful slideshows of your top selling products. All of these are essential for presenting your products in a visually appealing way that is sure to turn readers into customers. A pricing table is also included for a clear breakdown of your pricing if you offer services and the responsive and retina-ready design ensures people on mobile devices will be able to make a purchase without any problems. A smart search helps them find the exact products they want and the WPML integration makes it possible for buyers from different countries to shop in your online store. 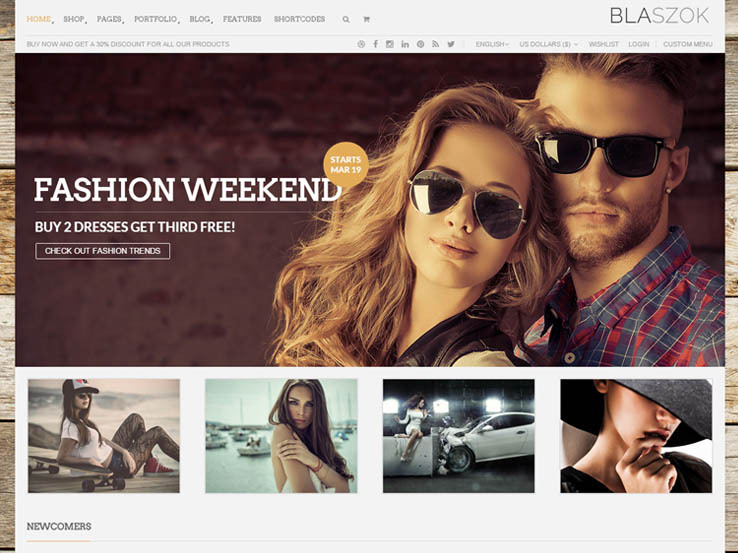 Along with powerful customization features, SEO optimization, Lookbook and wishlist settings, and so much more, the Blazsok theme has everything you need to create the ultimate online store. Display is a solid choice for a small business looking to create a high impact with their website. The theme starts off with a beautiful slider which is a great place to introduce your company and feature your services along with a call-to-action button. Provide a short description of everything you offer and link those descriptions to a page where they can learn more about each and every type of service. You can also share testimonials from past clients along with their logos to build your credibility. Feature members of your team with their bio and social media links and include their photo for a personal touch. The portfolio section is displayed in a clean grid layout with thumbnails which lead to a full page for each project. Finally, a beautiful contact section includes your email address, location, and phone number, along with a contact form to make it as easy as possible to get in touch with you. Display is powered by Tesla Framework, a powerful frame and administration tool that allows you to easily customize the look and functionality of your theme, without advanced knowledge of web development. Change the colors, fonts, upload your own logo, and much more. You can also use various shortcodes to create special offers, buttons, pricing tables, tabs, team members, and more. Along with responsive design, video background support, and several page templates, the Display theme packs quite a punch so keep it on your list of themes to try. 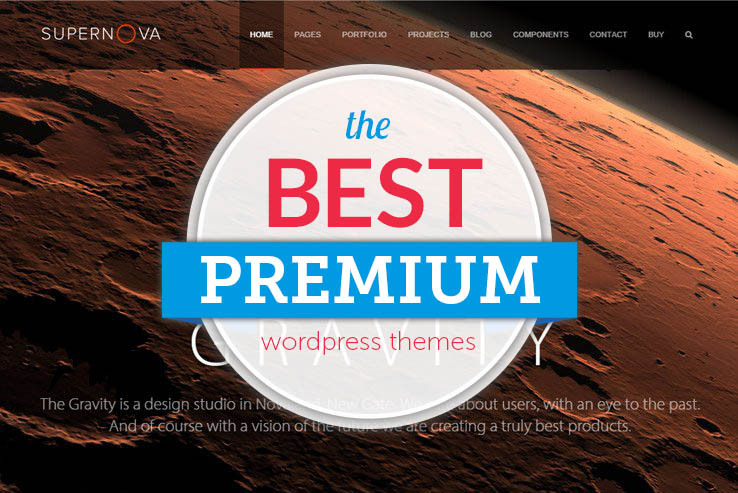 Truly, this is a tremendous collection of WordPress themes. 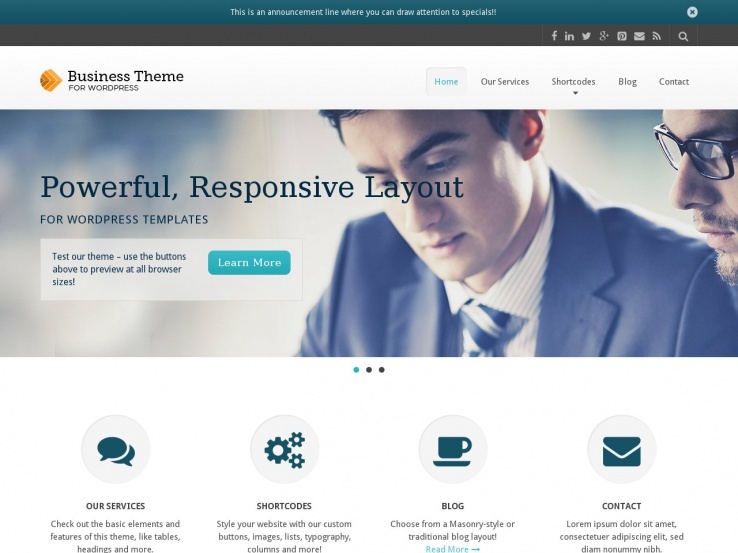 I can view plenty of best business WordPress themes in this blog. Your writing is very useful and outstanding. Really, this is a gigantic gathering of WordPress topics. I can see a lot of best business WordPress topics in this online journal. You’re composing is exceptionally valuable and remarkable.